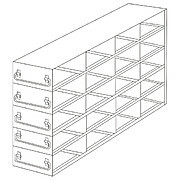 Racks are for 50-Cell Hinged Top Plastic Boxes. 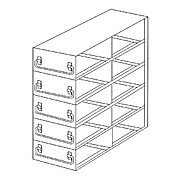 Drawer Racks allow an easy access to fewer microtube boxes at a time thus protecting other samples in the rack from warming up. Constructed of corrosion resistant stainsteel. 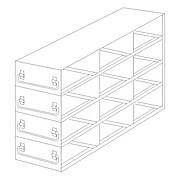 Upright Drawer Freezer Racks Pre-Loaded With 2" White Freezer Boxes w/ Dividers. 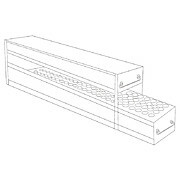 Racks for Blood Sample Tubes. Constructed of corrosion resistant stainsteel. 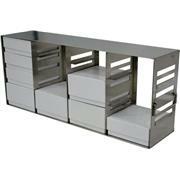 Drawer Racks facilitate both access to and storage of samples without removing the whole racks from the freezer. 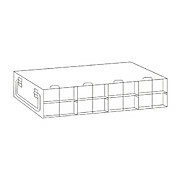 Upright Freezer Racks Pre-Loaded With 2" White Freezer Boxes w/81 Place Dividers. 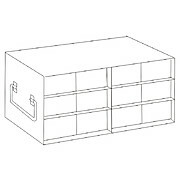 Storage Drawers with Lids for a wide variety of tubes,bottles,boxes,etc. Constructed of corrosion resistant stainsteel. 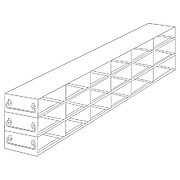 Upright Freezer Drawer Racks for 100-Place Slide Boxes. Constructed of corrosion resistant stainsteel. Racks for specially designed to provide an ideal alternative storing large quantity of samples in 15ml and 50ml centrifuge tubes. Constructed of corrosion resistant stainsteel. 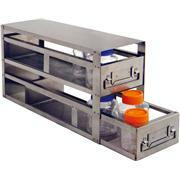 Drawer Racks facilitate both access to and storage of samples without removing the whole racks from the freezer.